Tens of thousands of Greeks took to the streets of Athens streaming towards two separate rallies which have divided the nation. 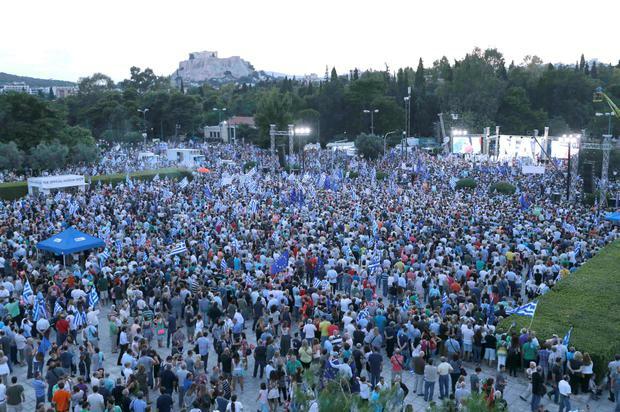 In Syntagma Sq, before Parliament buildings the Syriza party held a party urging a No vote. Musicians entertained the massive crowds ended each performance with shouts of Oxi (No) which echoed around the historic square. Just blocks away tens of thousands more had gathered at Kalimarmara, in front of the Olympic stadium one of the most significant Greek monuments associated with the Games. There crowds gathered among a sea of blue. European flags mixed with thousands of European Union flags as the crowds danced to the musicianos. At Syntagma the smattering of Greek flags mixed with those of Syriza. Greeks made the most of the free transport around Athens to flock to the rallies. 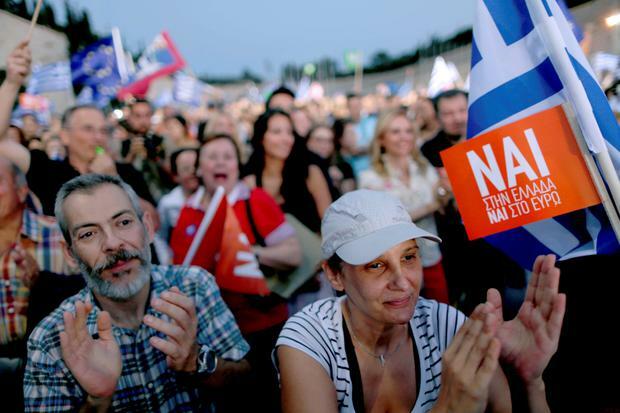 Trains running to Syntagma Sq were filled well beyond capacity with the station brought to a standstill as No voters surged through chanting Oxi. As both rallies continued a festival atmosphere remained around the city. But authorities feared the underlying tensions could spill over into violence with riot police stationed near the rallies. At the Yes rally three former Prime Ministers joined the crowds much to the delight of those gathered. 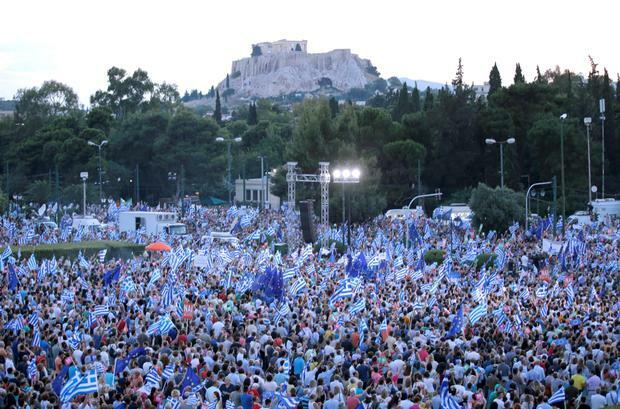 But it was the appearance of Tsipras at Syntagma Sq that received the biggest reaction. Meanwhile the result of Sunday's referendum is too close to call, according to polls. An IPSOS poll published this evening puts the Yes vote on 44pc, No on 43pc on undecided on 12pc.